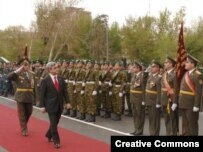 “We shall build the Armenia where mutual respect, love, and tolerance will prevail,” Serzh Sargsian swore on April 9, 2008 in his inaugural address, hidden behind a police wall that encircled most of central Yerevan. The Northern Avenue in downtown Yerevan that has been the scene of daily meetings of opposition supporters over the past year was cleared of all protesters and remained under tight police control for the second consecutive day on Thursday. David Jalalian, a journalist from the A1Plus.am news service who covered the incident, was beaten by one of the policemen and hospitalized from the scene.